I have a Hakko 936 soldering iron. The base unit is factory original, however the pencil is from eBay. As it turns out, the pencil is either a factory reject, or it is a counterfeit.The knurled section on the bottom did not mate with the section below – the threads were too large. I’ve suffered this for several years, simply pressing it back on to the base after it pops off. However today it annoyed me enough to necessitate a fix. 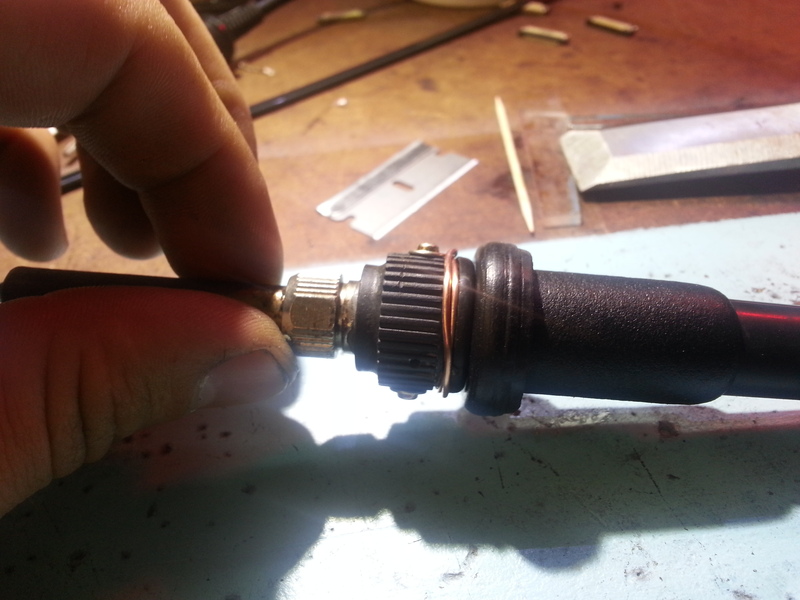 I I drilled two holes through the outer knurled section, and inserted two self tapping screws. I also wrapped a band of copper wire around the base to prevent the two screws from becoming a cantilever upon which the tip could pivot. Works beautifully. Now I can get back to real work. The Hakko 936 (and related accessories) were and are indeed highly counterfeited.